Wow, that was a rough day. So many stories to tell, and so much pain to describe, but I’ll be succinct and focus on little stories/tidbits. – Woke up at 4 a.m., out of the house at 5:15 a.m., and took a cab to the subway. Got there early, so went inside a 24 hour Duane Reade and read US Weekly. 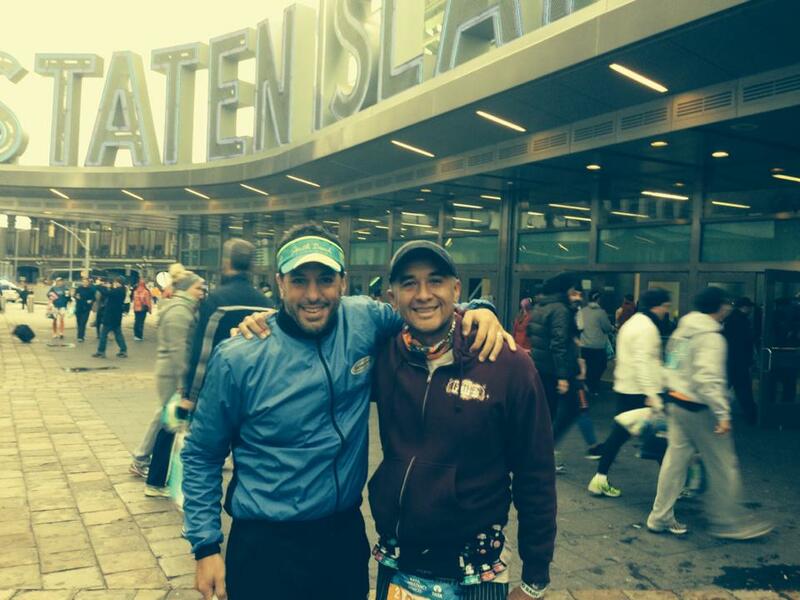 – Met up with my best buddy Fernando at the W 72nd Subway at 6 a.m. and took it down to the Staten Island Ferry. Met up with another friend Isela. Once on SI, saw another friend Bill. Took a bus from the ferry to Fort Wadsworth to wait until race start. At the Staten Island Ferry with Fernando. – The day before, went to a thrift store and bought some warm clothing and a fleece blanket to keep me warm during the wait, which wound up being like 2 hours. Scores of others seemed to have the same idea. No one appeared to be fashion conscious. – At race start, temps were in the low 40s and winds were howling. Once on the Verrazano Bridge (I was on the lower level), wind speeds picked up. Easily exceeded 40 mph. Smaller female runners in front of me were literally blown off their feet and into other runners. I wore two thin long-sleeved tops with a short-sleeved MagnaCare racing shirt on top, and MagnaCare tri shorts on the bottom. Wore a visor and over-the-ear headphones with an arm-band holding my iPhone. Created a 7 hour playlist of great tunes to keep me well entertained. Coldness and wind had no effect on my spirit. I like battling bad weather. I don’t like running into a headwind for 20 miles though. – Once over the bridge and into Brooklyn, winds seemed to die down and sun came out. People discarded clothing like at a burlesque club. Became a little dangerous for those folks who had to run over clothing in the roadway thanks to others who didn’t make a better effort to throw extra clothing to the side. – Running through Brooklyn was uneventful, but still magical and fun. This was the easiest part of the race, and the most enjoyable thanks to crowd support. Saw childhood best friend Jeff and his son Aedan. Missed seeing my friend James and Fernando’s brother Louis, but was still in very good spirits. Focused hard to maintain a light and easy pace. Music had me pumping my fist and run-dancing at times. – Crossed the Pulaski Bridge into Queens and missed my friend John, but did see friends Brian and Christine. Noticed their sign saying “Go Greg Gordon.” Misspelling of my name got me into a tizzy (which they didn’t see) but found myself distracted thinking about it and covered a mile swamped in those thoughts. I owe them thanks for that. – Before I knew it, we were ascending the Queensboro Bridge. MANY people walking and in pain; I took little steps, found a good rhythm and had zero issues. Only pain was the descent; legs began to show major signs of fatigue. – 1st Avenue was crazy as always, but I drowned it out with my music and was primarily focused on running on the left side to see various friends who said they’d be out watching. Saw John and Deanna at 85th Street, then Karen and Cindy a little bit later. Just before that, saw Jeff T. but had to shout out his name as he had missed me. Later saw college friend Andrea volunteering at a water station, then saw friend Michael at like 102nd Street who gave me a huge reception. Felt so good at a time when I began to feel so bad. Legs really began to fail me (around mile 18), but then saw three or four tri friends who cheered me on, and which boosted me a bit (pride and vanity are powerful motivators). – Got to the 1st Ave Bridge and found it again to be easy. Realized going uphill was a piece of cake; downhills were a concern. 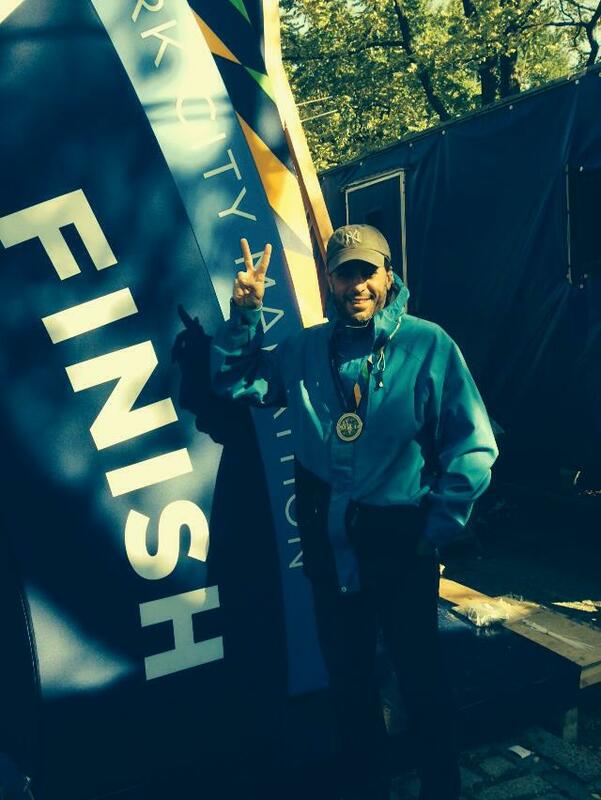 – Found myself struggling badly in the Bronx and was consumed with thinking about my beautiful Roya and how badly I wanted to see her at mile 21.5. Knew it wasn’t long to see her, and committed to not stop until I did. It became painful to run to the Madison Avenue Bridge, but persevered. 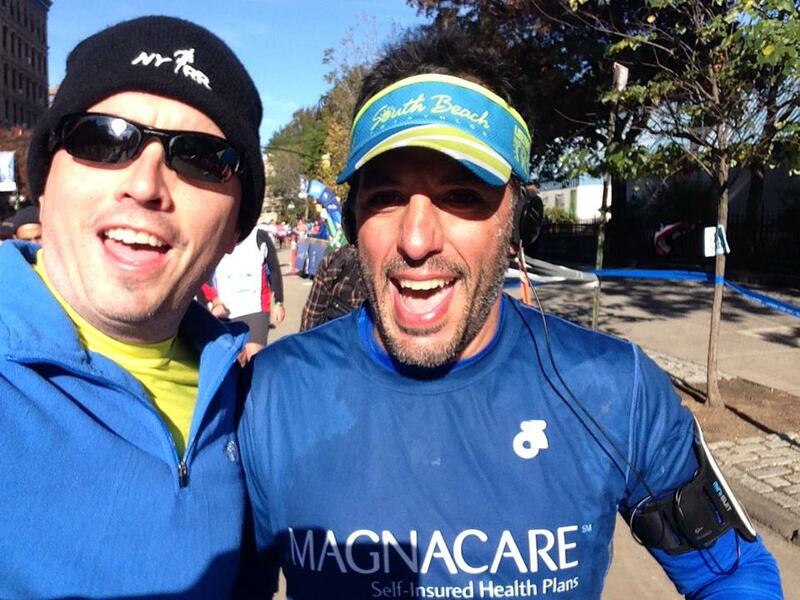 – As I got onto 5th Avenue, my buddy Brad was there (as a spectator/supporter) and ran with me towards my brownstone. With a block to go, he ran ahead and told them I was about to come by. Saw my poor mom suffering in the cold just to see me, and I gave her maybe a 30 second hug, kissed her, told her how much she meant to me, then greeted everyone else (Roya, neighbors, my super, Dad). Spent maybe 2 minutes with them, cracked some jokes, then took off with Brad. – Made it to 118th Street before I finally had to walk. Started running again at 112th Street and ran to 102nd Street before walking again. Started running again at 98th Street, said goodbye to Brad at 91st Street, and entered Central Park at 90th Street. In the walk/run pattern, major issues with roving cramps, the perception of very weak joints (felt like legs were toothpicks ready to snap), and general apathy, but I kept my smile and tried to be cheery. Brad was the best distraction I could ask for. Amazing friend Brad running with me for support. – Saw tri-friend Alex who took an amazing picture of me looking happy… and I was generally happy to be a part of it, but I was physically destroyed and still had a 5k left. Mile 23. Looks like I’m feeling great! I wasn’t. – Walked/ran intermittently until mile 25 and committed to myself that I would run the final mile no matter what. Got to mile 25.2 (per GPS) which was roughly in the ramp between Grand Army Plaza and the Central Park Drive. A couple of people patted me on the back with encouragement; I received it well emotionally but couldn’t produce much outward emotion to show thanks. – Ran across 59th Street and didn’t acknowledge the crowds. 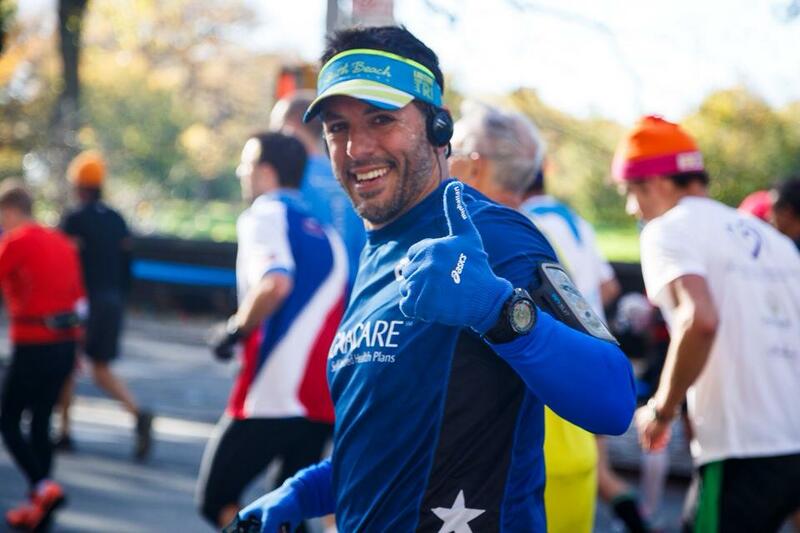 I was embarrassed to be in such bad shape, I was battling so many physical issues, and I had to focus on just getting one step in front of the other on the pavement. – Made the turn at Columbus Circle and entered back into Central Park. Spirits definitely improved and I did my best to look around and appreciate everything around me. – Got to the left side of the finish line and crossed with my hands in the air. I had hoped to feel exalted and thrilled, but I instead felt tremendous discomfort. I knew it would be temporary and I was not in any danger, so I swallowed it all, tried to show grace to other athletes (a few hugs given to strangers), profusely thanked the person who gave me my medal and my bag of treats/drinks, and muddled through the crowd. – We were supposed to walk for a long while, but I saw a few athletes skip in between some gates, so I followed suit and got out of the park as fast as I could. The speed with which I moved was comparable to hot lava flowing. – Made it to Central Park West and called Roya. Coordinated a meetup, called an Uber car, and got home. Getting out of the Uber car was a major challenge, and walking down the block to my home was with a speed comparable to cold lava flowing. 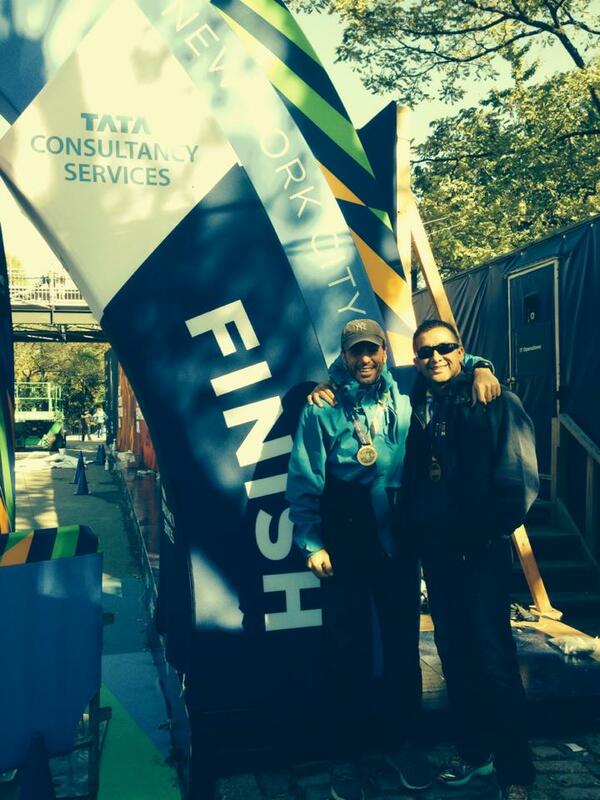 – Took the next day off and went to the finish line with Fernando to take selfies and take in the aura of what we had accomplished. En route, we came across this massive hill and were challenged to ascend it. It must have had a 1% grade for like 6 or 7 feet in length, but despite both of us suffering from extreme stiffness and soreness, we huffed over it in record time (easily under 2 minutes) but the descending stairs leaving one of the tents became a grave challenge that was mitigated only by the presence of a handrail, on which my hand laid down a death grip. A few minutes later, mission accomplished and we were at the bottom of that intense challenge. 8 steps have nothing on us marathoners! Fernando and I celebrating my 2nd finish and his 10th in a row. He’s incredible and so inspiring. – Second day after the race and stiffness and soreness still prevail. Brought the finisher’s medal to work and colleagues are impressed. Invariably, the question is asked about my time. I try to be swift and accurate, but cannot avoid the reality that I just wasn’t ready and that it was only sheer will power that got me through. I’m no quitter. – Said on race day, “This is it. No more long course stuff for me. This body just isn’t made for long course.” Said today to Fernando, “Strongly thinking about avenging this experience in 2016.” Amazing how a period of reflection can create an illusion of ability. 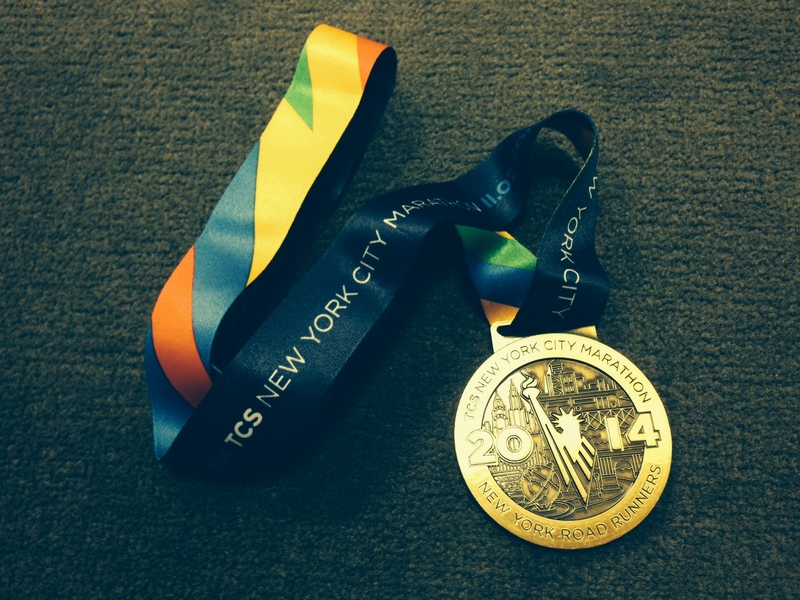 Follow comments by subscribing to the 2014 NYC Marathon Race Report Comments RSS feed.